Ten years ago, a Memorial-area couple by the names of John and Jennifer Randall contacted us. They had just bought a beautiful lot located off of Piney Point drive. Because Jennifer loved the French, and because John was Acadian from Louisiana, they had already decided to have their home built in the style of a modern French country house. 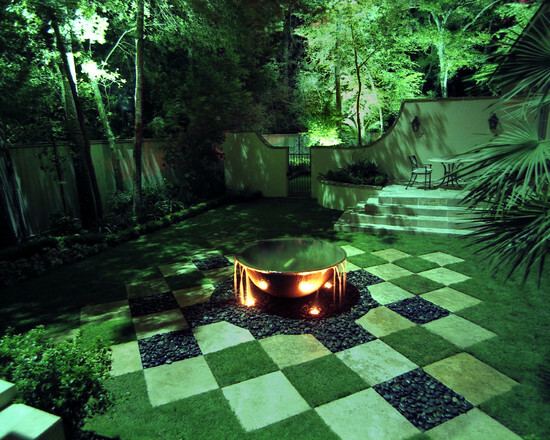 The Randall’s wanted to landscape the property in accordance with a European theme, with a paver driveway and partier garden in the front, and a very large and uniquely styled pool in the back to host summer parties. However, the premier element to this landscaping project was to be a private morning garden they asked us to create in the far East corner of their yard. The Randall’s wanted this corner set apart as separate, personal space, consistent with French design elements, but with the consciousness of Zen. It was to be a place just for the two of them to relax, talk quietly, and read in the early morning and evening hours of the day. To establish the feeling of Zen, we first built a very special kind of fountain in the center of the morning garden known as a disappearing fountain. (Another term you may have heard to describe this feature is vanishing fountain.) 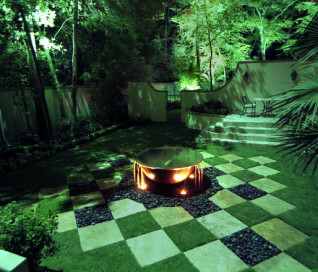 The fountain itself was made from a cast iron container shaped like a Louisiana sugar cauldron. This not only supported the French elements of the landscape, but also directly referenced John’s Acadian origins. The concrete water tank was concealed underground beneath the cauldron, and hidden jets filled its center to overflowing, causing it to pour over the sides and onto the steel mesh deck that was concealed under dark moon stones. There, it circulated back into the tank, to be returned to the fountain again by a silent pump. This deceptively simple design created the illusion that there was no base to the fountain, and that the water itself was mysteriously vanishing back into the Earth. 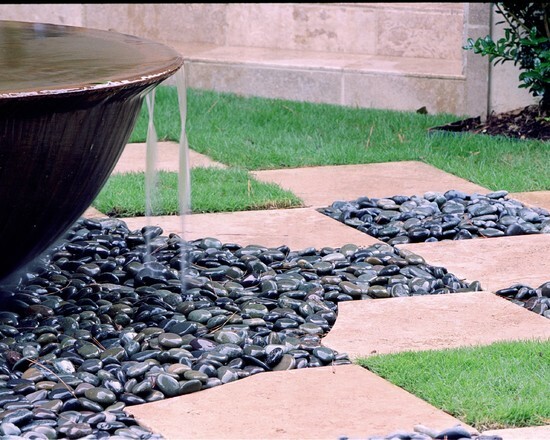 To establish geometry and symmetry in the center of the morning garden, we laid down a hardscape/softscape space in the grass that surrounded the fountain. 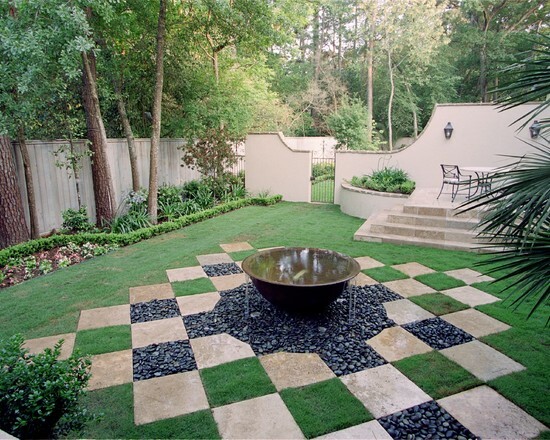 We interspersed travertine blocks through the lawn in such a way as to form proportional, perfectly-shaped squares of green space that alternated like a checkerboard within the stonework. 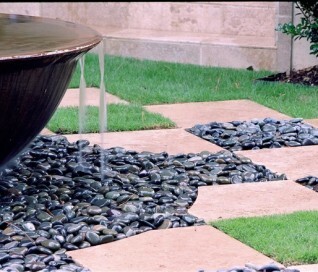 In a few of these places, we further ornamented the softscape with the same gravel that surrounded the vanishing fountain. 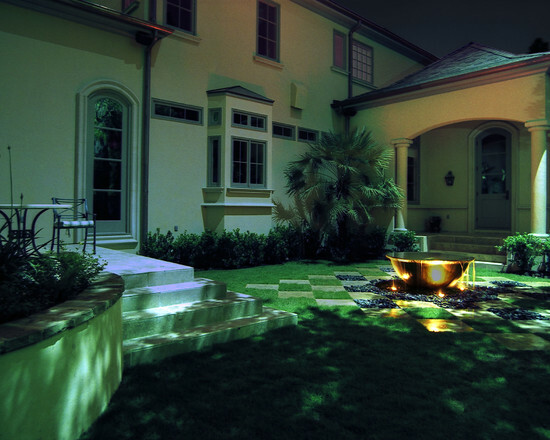 This sharp contrast of light and darkness provided the ever so subtle suggestion of Yin and Yang that added the Zen element the Randall’s wanted to an otherwise European design theme. We then planted greenery all along the wooden walls that surrounded the property, deliberately integrating curved spaces into the linear planting areas to soften the sharp right angles of both the walls and the hardscape/softscape design. Palm and bottlebrush trees worked to give the morning garden a sense of private enclosure, while azaleas, seasonal flowers, and boxwoods created gentle ornamental touches and alternating shades of light and dark ground cover that maintained the French theme of the landscape. 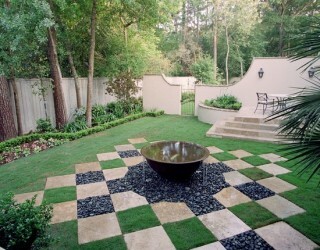 The project was completed with the construction of a private patio just large enough to seat two people. Here, the Randall’s could read the paper at sunrise from an elevated vantage point overlooking the fountain and greenery. 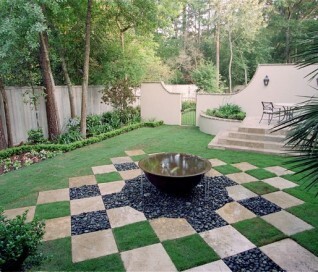 While their family, friends, and neighbors instantly fell in love with the architecture of the house and the entertainment areas surrounding the pool, the Randall’s always told us that, out of all the many elements we designed in their landscape, they loved their morning garden the most.